It's that time of year again, Halloween, when all of the sugar hoopla starts. I cringe at the idea of my kids eating all of that sugar but know full well that the older they get, the harder it is to take it away. As a kid, my mom banned us from having sugar for about 2 years (shes just plain evil). My sisters and I talk about those painful sugar-free Halloweens and have vowed to never torture our own children like that. I'll admit it, Ive been tempted. This Halloween, I'll let them have their candy. These are some everyday sugar-loaded foods that I have been cutting out of their diets. This is going to make much more of a difference than a few fun size candy bars! He's just FUSSY! My adventures with Sensory Processing Disorder. Let's start at the beginning. My oldest son was the fussiest baby on earth. I'm not sure that it's a scientific fact but it certainly seemed that way at the time. Looking back almost 7 years, I wish I knew then what I know now. He had all of the signs of SPD (Sensory Processing Disorder) however, just seven years ago, this disorder was way under a normal pediatricians radar. As an infant, his fussiness was attributed to reflux, colic and allergies. As a toddler his rough play and excessive tantrums were attributed to his frustration with delayed speech. At the age of 4, he had seen numerous developmental pediatricians and child psychologists and the only answer was SPD. She's a psychiatric nurse and thinks everyone is crazy. If you have seen the movie My Big Fat Greek Wedding, you will understand the reference to my mothers vinegar obsession. The father in the movie is a Windex maniac and puts it on anything and everything. Well THAT is how my mother is about vinegar and that is probably why I cant stand the stuff. We've got a new FYSF Giveaway for you because Cloth Diapering ROCKS! This week you can enter to win some great cloth diaper accessories and staple items. 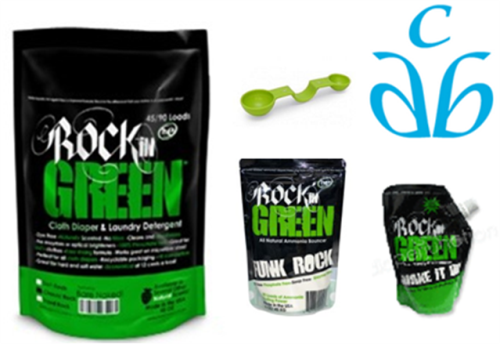 A bag of Rockin' Green Cloth Diaper Laundry Detergent, Rockin' Green Shake It Up! Pail Freshener, Rockin Green Funk Rock Ammonia Bouncer and Rockin' Green Laundry Scoop. These are items that every cloth diapering family is sure to be able to use! Ready to see who the lucky winner of our Feed Your Stash Friday Giveaway was? The lucky winner of the Flip Diaper Day Pack will recieve (2) covers and (6) stay-dry inserts! 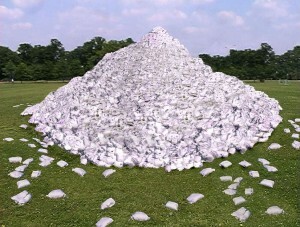 I'm no environmental saint, but I can't help but laugh when people are amazed that I use cloth diapers. Have we gotten so consumed by our disposable lifestyle that the idea of washing and reusing something is so mind blowing? Changing your baby's cloth diaper just got easier with the Flip One Size Diaper System! Take off the diaper, TOSS the used insert into the pail, REPLACE with a clean insert, and REUSE the cover! This week for Feed Your Stash Friday we're giving you a chance to win (1) Flip Diaper Day Pack which includes (2) covers and (6) stay-dry inserts. I used to take the subject of babies sleeping VERY seriously. Now I am on my third baby and I look forward to those sleepless nights. No, I'm not crazy! Thirsties Duo Diapers are a great workhorse diaper. Families love them for their quality design, front and back pocket opening, unique prints and colors. This week for Feed Your Stash Friday we're giving you a chance to win (2) Thirsties Duo Diapers. The lucky winner will receive a new Preppy and Phantom Rumparooz OS Diaper with snaps.